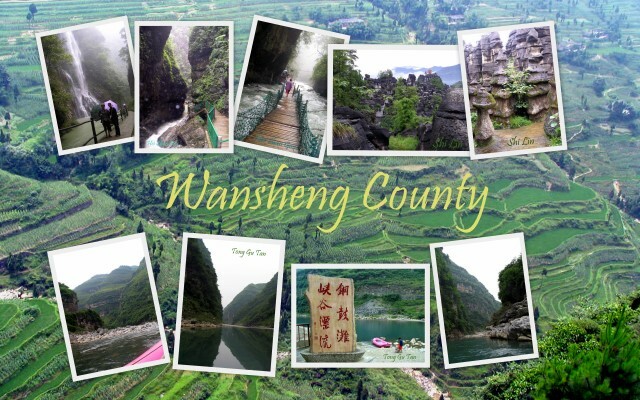 Wansheng City is the gateway to some wonderful one day or weekend escapes. Hiking at Black Mountain Valley or the Stone Forest and rafting Tong Gu Tan are just three great places of interest in the county. The lofty and steep sided mountains of the region rival those of the now famous Longsheng with tiers of rice terraces cascading down the slopes. Wansheng, the county seat can be reached by bus from Nanping (90 mins) and train and good range of accommodation is plentiful. Hei Shan Gu 黑 山 谷 Black Mountain Valley is one of the prettiest places in Chongqing and is a relatively comfortable day trip from the city. A public bus (Y5) from Wansheng leaves regularly from the tourist kiosk and takes about one hour to the north gate. This scenic spot is actually two rivers running through deep narrow gorges. A cable car (Y20) cuts the descent time into the gorge and affords spectacular views of the river, falls and forest beneath it. Shi Lin 石 林 Stone Forest sits like a crown of jewels on a mountain peak about 20kms from Wansheng. A public bus (Y5) leaves regularly from the tourist kiosk in town and takes about one hour. It\'s a steep climb from the car park to the stone forest which is often shrouded in low misty clouds which adds to its charm. There\'s a cave beneath the peak that\'s worth a visit but take an umbrella. Miao locals also perform singing and dancing daily. Check times before you climb up. Tong Gu Tan offered a three in one ticket which saved us Y40 overall. This may be available at the other attractions. Each of these can be done on a day trip, Hei Shan and Shi Lin can be done in a day or the three sites can be covered in a weekend. Hire a car in Guanba for the weekend, rafting on day one, staying overnight before visiting Shi Lin and Hei Shan on day two and have your driver return you to Wansheng to catch a bus back to Nanping. Buses from Nanchuan pass through as late as 7/7.30. Ask your driver to drop you where you can catch this if you get back to town after 4.30pm when the last buses leave from Wansheng. Ao Tao Ji 奥 陶 纪 is another geological park, similar to Shi Lin but includes beautiful waterfalls, streams and mysterious sink holes where these streams literally dissappear. The park is stuated between Shi Lin and Heishan Gu. Wansheng also offers hot springs and several lesser known attractions in the district. Accommodation is available at all Scenic Spots but the best choices can be found in Wansheng town.